In 2006, Americans consumed about twenty-eight gallons (106 liters) of bottled water per person per year (nearly one twelve-ounce [350 ml] bottle per day).1 Because bottled water seems to have become an important part of the daily average diet, let’s look at how much energy bottled water consumption requires and how this compares with energy related to total food consumption. For example, drinking one quart (1 liter) of local bottled water each day for a month produces the same amount of carbon dioxide as driving a car twenty five miles (40 km) or leaving a car idling in the driveway for three hours.3 However, unrefrigerated tap water is at least two hundred times more energy efficient compared to bottled water.4 Thus, switching from bottled water to tap water is a good step toward reducing carbon emissions. 1. International Bottled Water Association, “Beverage Marketing’s 2006 Market Report Findings,” (2007), https://www.bottledwater.org/public/Stats_2005.doc, accessed Jan. 25, 2008. 2. The report by N. Jungbluth, “Comparison of the Environmental Impact of Tap Water vs. Bottled Mineral Water,” (Swiss Gas and Water Association, 2005) was used in these calculations, http://esu-services.ch/fileadmin/download/jungbluth-2006-LCA-water.pdf, accessed Jan. 25, 2008. 3. This calculation assumes that 4.2MJ of energy is used to produce one liter of bottled water (plastic bottle and domestic water) (Jungbluth 2005) and that a car uses 0.3 gallons of gas per hour when idling (Natural Resources Canada, Office of Energy Efficiency: https://www.nrcan.gc.ca/energy/efficiency/communities-infrastructure/transportation/idling/4459, accessed May 1, 2008. 4. A. Carlsson-Kanyama, et al., “Food and Life Cycle Energy Inputs: Consequences of Diet and Ways to Increase Efficiency,”Ecological Economics (2003), 293-307. See also Jungbluth (2005). It is estimated that agriculture-related emissions account for at least 20 percent of global greenhouse-gas emissions.1 This might be somewhat surprising, considering all the attention that is normally focused on transportation and home energy use. However, commercial agriculture and the need to feed more than 6 billion people create significant energy demands and impacts. 1. While varying estimates of agriculture-related emissions exist, this estimate is based on the contributions from livestock (16 to 18 percent) and plant-based agriculture (less than 5 percent) and serves as a lower bound. 2. H. Steinfeld, et al. (2006). 3. The term livestock generally refers to any domesticated animal such as cattle, sheep, pigs, and chickens that are raised for food or fiber. The estimates of livestock-related, greenhouse-gas emissions from the U.N. Food and Agriculture Organization show that the largest share of CO2 emissions comes from land use changes associated primarily with deforestation caused by demand for feed grains and grazing land. 4. D. Pimentel and M. Pimentel, Food, Energy And Society, 3rd ed. (Boca Raton, FL: CRC Press, 2008). The transport of food around the world is an important part of the industrial food system, but what impact does food transport have on global emissions? Does eating local food really make much difference? To help answer some of these questions, let’s look at the concept of “food miles.” Food miles refer to the number of miles a food product has traveled to reach your plate. The idea is that the farther away a product is grown from the point of consumption, the greater the number of food miles and transportation-associated emissions. Although the connection between food miles and emissions makes sense, the relationship is actually more complex. 1) Local transportation by truck emits 0.06 pounds (26 g) of CO2e – 17 percent of the emissions associated with growing cherries. 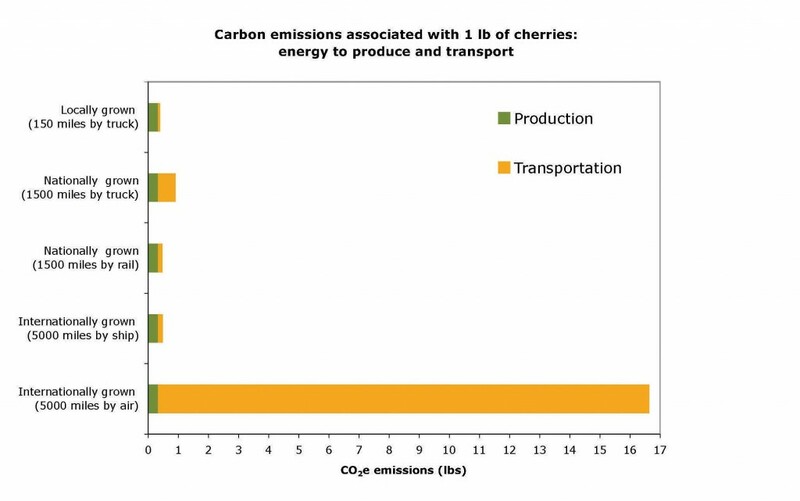 2) National transport by truck emits 0.59 pounds (262 g) of CO2e – 175 percent of the emissions associated with growing cherries. International transport for Chilean cherries by boat emits only 0.15 pounds (67 g) of CO2e – 44 percent of the emissions associated with growing cherries, illustrating that transport by boat is quite energy efficient. Figure 1. Emissions of CO2e associated with growing and transport of one pound (0.45 kg) of cherries using four different transportation scenarios that differ by the method (truck, ship, rail, or air freight) and distance (local, national, and international). In all scenarios, the emission associated with growing the cherries (production) is assumed to be constant. However, cherries would probably not survive the two-week trip from farm to market using a boat, so overseas cherries are normally freighted by air, thus emitting 16 pounds (7,410 g) of CO2e, or about fifty times the emissions associated with growing cherries. In this case, transportation emissions due to air cargo are 280 times larger than local transportation by truck and even one hundred times larger than transportation by boat. So purchasing a pound of air-freighted cherries is like letting your car idle in the driveway for two and a half hours. Labeling air-freighted food products according to their place of origin would help consumers make informed decisions about their purchases. If we carry out the food-miles calculation a bit further, we find that if an individual ends up driving twenty miles (32 km) roundtrip to a farmers market solely to buy these cherries, the resulting emissions would be similar to purchasing the air freighted cherries. 1. IPCC, Aviation and the Global Atmosphere: A Special Report of IPCC Working Groups I and III in Collaboration with the Scientific Assessment Panel to the Montreal Protocol on Substancesthat Deplete the Ozone Layer, J. E. Penner, et al., Cambridge: Cambridge University Press, 1999). 2. A. Carlsson-Kanyama, et al., “Food and Life Cycle Energy Inputs: Consequences of Diet and Ways to Increase Efficiency,”Ecological Economics (2003), 293-307. 3. Great Britain Department for Environment, Food and Rural Affairs (DEFRA), The Validity of Food Miles as an Indicator of Sustainable Development: Final Report Produced for DEFRA (Didcot, UK: AEA Technology Environment, 2005), http://library.uniteddiversity.coop/Food/DEFRA_Food_Miles_Report.pdf, accessed Jan. 25, 2008. 4. C. Saunders, et al., “Food Miles: Comparative Energy/Emissions Performance of New Zealand’s Agriculture Industry,” Agribusiness and Economics Research Unit (AERU), Lincoln University research report number 285 (2006), https://researcharchive.lincoln.ac.nz/handle/10182/125, accessed Jan. 25, 2008. 5. We used Carlsson-Kanyama’s (2003) “Food and Life Cycle Energy Inputs” to estimate the energy required to grow cherries. When we turn on the lights, the energy we are using most likely comes from a coal-fired or natural-gas power plant. Although renewable energy sources are sometimes used, especially hydroelectric power, the majority of electricity produced in the world comes from the burning of fossil fuels. If we understand that energy use, the burning of fossil fuels and greenhouse-gas emissions are all intimately linked, then it makes sense that anything that requires energy, such as the production, transport, and disposal of a product, is also going to create some greenhouse-gas emissions. To illustrate this, let’s compare an apple, which one can enjoy eating, with an iPod, which one can use to enjoy music. The value in such an experiment is to understand that whenever purchases are made, whether it is an apple or an iPod, a bagel or a bicycle, energy was used to produce that product and, as a result, some greenhouse gases were emitted. We call this embodied energy, and, although hidden from sight, it’s real and quantifiable.7 This also relates to the question of what an individual can do about greenhouse-gas emissions. Although most individuals understand that they have some control over their residential- and transportation-related emissions, most feel they have no control over or connection with the emissions from factories and industry. However, when we understand the idea of embodied energy, this perception changes as we consider that those factories are making products (food and consumer products) for us, the consumers. Estimates in the United States suggest that 80 percent of energy use and greenhouse-gas emissions are a result of consumer demand and the economic activities related to those demands.8 Significant reduction in carbon emissions can also be achieved both by consuming less and by consuming smarter. Choose products that utilize ecologically intelligent design principles (e.g., “cradle to cradle” 9), that require less energy to make, that last a long time, and that can be completely recycled and reused after use rather than thrown away. 1. This type of calculation is called a cradle-to-grave analysis, where the full life cycle of the product (development, design, production, and disposal) is considered in terms of environmental impact. 2. Estimates of the energy required to grow an apple are 8 MJ (megajoules, where 1 MJ = 10 6 joules) per kg. A. Carlsson-Kanyama, et al., “Food and Life Cycle Energy Inputs: Consequences of Diet and Ways to Increase Efficiency,”Ecological Economics (2003), 293-307. 3. For such electronic devices with an average consumer lifetime of about three years, the energy to power the device is probably only about 20 percent of the energy needed to make the device. E. Williams, “Energy Intensity of Computer Manufacturing,”Environmental Science and Technology, 38 (2004), 6166-6174 (https://pubs.acs.org/doi/10.1021/es035152j). 4. Many countries including the United States and Canada have laws prohibiting electronic components going into landfills because of toxic residues that may leach into the groundwater, so a company must dismantle, recycle, and dispose of this device properly. For more information about the chemicals used in the electronics industry and what happens to the products after use, see the Silicon Valley Toxics Coalition Web site at http://svtc.org/, accessed May 8, 2008. 5. Our estimate uses the energy analysis of Williams 2004 who estimates the energy required to produce a personal computer. We then scaled these estimates either by weight or by cost for an iPod classic (weight 140 grams; price $250). These estimates have a large uncertainty based both on the validity of our assumptions and also the analysis of Williams (https://pubs.acs.org/doi/10.1021/es035152j). 6. E. Williams (2004) (https://pubs.acs.org/doi/10.1021/es035152j). 7. This experiment is not intended to criticize the Apple iPod, but rather to convey the idea of embedded energy and life-cycle analysis, where a product’s interaction with the environment is measured from cradle to grave. It should also be noted that although the estimate of energy required to make the iPod may seem high, the iPod is quite energy efficient in comparison to other electronic devices. In addition, it is also recognized that Apple as a company has a fairly progressive environmental policy for all their products (https://www.apple.com/ environment/). 8. S. Bin and H. Dowlatabadi, “Consumer Lifestyle Approach to U.S. Energy Use and the Related CO2 Emissions,”Energy Policy, 33 (2005), 197-208. 9. The concept of cradle to cradle was popularized by William McDonough and Michael Braugart in their book Cradle to Cradle: Remaking the Way We Make Things (New York: North Point Press, 2002) and suggests that design emulates the principles of nature where nothing is wasted, but everything is recycled and put back into the system for another use. The classic example is an apple tree, which appears to dump its waste of leaves and fruit every year, but ultimately this waste goes back into nature as food and habitat for other plants and animals. We understand that food contains energy as described by the number of Calories.1 It also takes energy to make food and that energy can be estimated. The energy efficiency of a food item can then be defined as the total amount of energy required to produce the food divided by the total amount of energy the food contains.2 Published estimates show that vegetables and grains such as potatoes, rice, and corn have an energy intensity of about 1.2 to 2.5, whereas the energy intensity of meats such as chicken, pork, and beef ranges from 16 to 68.3So, in general, it takes significantly more energy to make food from animal products than it does to grow vegetables. In terms of understanding the impact of food on climate, we note that, in addition to energy, the production of animal-based foods generates significant emissions of methane, an important greenhouse gas. So when we compare different food items, the carbon intensity, or the carbon emissions (associated both with the energy to grow the food and any animal-related emissions) per 100 Calories of food item, is a more accurate method for measuring the impact of food on climate.4 Let’s compare the carbon intensity of different foods using Figure 1.5For example, whereas 100 Calories of corn emits 11 grams (0.024 pounds) of carbon dioxide, 100 Calories of pork emits 308 grams (0.7 pounds). Red meats (beef, pork, and lamb) have the largest carbon intensity; chicken and dairy are more efficient.6 The carbon intensity of fish products varies; farmed salmon has about the same as most red meat; farmed shrimp has a higher carbon intensity (more than 400 grams (0.9 pounds) CO2 /100 Calories)7 , and other fish, such as herring, have a lower carbon intensity (about 25 grams (0.025 pounds) CO2 /100 Calories). Vegetables and fruits, in comparison, generally have the lowest carbon intensity. Figure 1. Estimates of the carbon dioxide intensity of various food products given in grams of CO2e per 100 Calories. Calculation includes emissions of methane and nitrous oxide. For example, 100 Calories of milk produces 247 grams of CO2e, while 100 Calories of potatoes produces 23 grams of CO2e. 1. North Americans commonly think about food energy in terms of “Calories.” By definition, a calorie of energy is actually quite small, so common practice is to refer to Calories in multiples of 1,000 or as kilocalories (kcal). It is also common practice to use the term, Calorie (with an uppercase ‘C’) to mean kcal, which we follow in this book. We note that most other countries report food energy in kilojoules, where 1 Calorie = 1kcal = 4.18 kilojoules (kJ). 2. The energy required to produce the food incorporates all aspects of growing, including farm machinery, irrigation, production, and application of fertilizers and pesticides. 3. In this case, energy intensity is defined as the ratio of energy required to produce the product divided by the amount of protein energy in the food. See D. Pimentel and M. Pimentel, Food, Energy and Society, 3rd ed. (Boca Raton, FL: CRC Press, 2008). 4. The calculation of carbon intensity includes the emissions associated with energy used to grow the food item, and any methane emissions associated with animal products. Nitrous oxide emissions due to fertilization of cropland have not been accounted for in this analysis and thus these calculations serve as a lower range for these intensities. 5. Figures for each food item come from estimates of Pimentel and Pimentel (2008). The input energy associated with each food item has been converted into CO2 emissions based on U.S. national emissions and energy-use statistics in a manner similar to that described in Eshel and Martin (2006). The agriculture-related methane or nitrous oxide emissions are also included through a conversion into CO2 equivalent using the procedure of G. Eshel and P. A. Martin, “Diet, Energy, and Global Warming,“Earth Interactions 10 (2006), 1-17. See also U.S. Department of Energy, Energy Information Administration, Emissions of Greenhouse Gases in the United States 2003 (Dept. of Energy, 2004), https://milk.procon.org/sourcefiles/DOE2003GreenhouseReport.pdf, accessed Jan. 25, 2008. 6. There are significant uncertainties in these estimates depending on both the method of growing the food and on the methodology of calculating the emissions. For example, Pimentel (2008) finds that energy inputs may be reduced by up to 50 percent or more for free-range beef and sheep. Comparisons with other published estimates of energy intensity can differ by less then 20 percent up to 200 percent or more as described by Carlsson-Kanyama (2003). 7. The relatively large emissions from some fish products reflect the relatively large energy demands of long-distance voyages required for fishing particular species. , accessed Oct.31, 2007; and J. Ziesemer, “Energy Use in Organic Food Systems” (Food and Agriculture Organization of the United Nations, 2007), http://www.fao.org/docs/eims/upload/233069/energy-use-oa.pdf, accessed Oct. 31, 2007. Food labels list information about the nutritional content of the food, allowing consumers to make informed and healthy decisions about what they eat. Included on many food labels is information about the perceived benefit of the food, how it was grown (such as certified organic), and its place of origin. In the United States, the Food and Drug Administration regulates food labels to ensure they are accurate and useful to consumers. Since all foods have a carbon footprint (carbon emissions associated with their production and transportation), what if food labels also contained information about the associated carbon emissions? At right is an example of what such a label might look like for a jar of peanut butter. Accompanying the standard nutritional information is the carbon footprint or the CO2 emissions per serving and for the entire jar. These calculations were made by EcoSynergy, who computed the energy to farm, produce, and transport peanut butter. 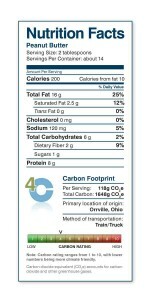 The label also includes a carbon rating between 1 and 10, so that consumers can better choose between high- and low-carbon foods. Labeling the carbon footprint of all food items would help consumers know more about how and where the food is grown and produced and what effect that product has on the environment. However, your best source for knowing more about your food is still establishing direct contact with the farmers who grow it and, if possible, the producers who make it. Composting1 can be done anywhere, anytime. It’s happening in the wild everywhere, always. Of course, you won’t want to do this when it’s unpleasant to work outside, but the compost will still work. Composting slows down in the winter and speeds up in the summer. It is common for people in snowy locales to build compost piles in the fall, when the trees contribute their leaves, and leave the pile alone until spring, when the air and soil are warm enough to work. In moderate and hot climates, you can build a compost pile any day of the year. 2) 1 part kitchen scraps – this can be any food scraps from your kitchen (peels, teabags, coffee grounds, shells, leftovers), except meat and dairy. 3) 1 part green garden scraps – any leaves, greens, or weeds from your yard. Don’t add any weeds with seeds or runners if you don’t want them coming back, especially Bermuda grass, crabgrass, ivy, mint, or anything that is taking over your yard already; also avoid adding thorns from roses, bougainvillea, etc. 5) Water – a couple of gallons to moisten the pile at the start. *A bin is not necessary for composting, but a lot of people find it helpful for managing the pile. Because almost all bins are plastic, made from petroleum, look for bins made from recycled plastic or mostly recycled plastic. If you are a do-it-yourself type, make one out of scrap wood or wood pallets. The Smith & Hawken Biostack bin is one of the best plastic bins, especially for turning a pile and accessing it daily. Start off your compost pile with a bunch of dry stuff, like several handfuls of straw and dry leaves. Then add any kitchen scraps you have on hand, and any trimmings, lawn clippings or weeds from your garden. Top off the kitchen scraps with more leaves, straw, or weeds. As you build your pile, make sure to keep the ratio approximately one part “green matter,” food and plant debris such as grass clippings, (the nitrogen) to one part “brown matter,” dry leaves and woody plants (the carbon). Every week, water your pile for a minute. If it’s really dry, water more. If it is moist already, don’t water. The goal is to keep the whole pile as moist as a wrung-out sponge. The outside of the pile will always be a little dry, use your pitchfork to check the inside and see if it is moist enough. Every two weeks turn your pile with a pitchfork. The goal is to turn the pile inside out, flip the top to the bottom, and mix the whole pile up while you’re doing so. While turning it, you’ll start to see who’s moved in, such as worms, sow bugs, soldier fly larvae, or other organisms doing their composting work. If you notice it’s really dry, add water as you’re turning it. If it’s too wet or stinky or full of fruit flies, add more dry stuff (leaves, straw, shredded newspaper) to each layer as you turn. 1) The pile is smaller than when it started. 2) You can’t recognize much of what you put in. 3) It has no smell or smells like fresh earth. 4) It looks darker, close to black (the color of humus). 5) It is not hot anymore. Once your pile is finished composting, remove anything that you don’t want in your garden, like a piece of wood that didn’t decompose yet, or a corn cob that still looks like a corn cob – put those things in your next compost pile. Take the finished compost and use it as a soil amendment in your garden. Compost improves soil texture, increases the organic matter available in the soil, increases nutrient exchange between plant roots and the soil, and generally brightens up all plants. The unseen life (good bacteria and fungus) in the finished compost rejuvenates plants and soils that have seen better days. The use of biodegradable plates, cups, and utensils as alternatives to plastic and polystyrene (Styrofoam) is on the rise. Made from sugarcane fiber, potato or corn starches, the tableware and eating utensils can be composted after use, instead of being thrown into landfill. When composting these products, keep in mind that they can take anywhere from a month to a year to fully degrade. However, it’s worth the wait, as it’s such a good feeling to compost your plate instead of throwing it into the trash! And the compost will do wonders for your garden. Our favorite distributor of compostable tableware is a non-profit organization, World Centric. Check out their Web site to get a flavor for the types of products available today. You’ll also get ideas on how to turn your next outdoor function into a compost-generating opportunity. It’s clear that food choices have an impact on energy use and greenhouse-gas emissions, but just how important are food choices in comparison to other activities, such as driving a car? We’ll use the estimates of carbon intensities of different foods to make this comparison. First, the average American drives about 10,000 miles (16,100 km) per year. Depending on the vehicle’s fuel economy, it emits between 1.8 and 5.2 tons of CO2e per year.1 Three types of cars were chosen for this calculation (Ford F-Series truck, Chevrolet Cobalt sedan, and the Toyota Prius hybrid sedan) to represent the different classes of today’s popular vehicles. Figure 1 shows the CO2e emissions of each vehicle. Today’s U.S. agricultural system provides about 3,700 Calories of food per person per day.2 From that, we can estimate the amount of CO2e that is emitted to produce this food because we know the type of food that is eaten (72 percent plant-based and 28 percent animal-based), and we know the carbon intensity of these foods.3 The result: the average American diet produces about 2.4 tons of CO2e per year – about the same as driving a car for a year. The results (see Figure 1) show the dramatic effect that changes in diet can have on CO2e emissions. In fact, the reductions in carbon emissions achieved by modifying one’s diet are similar to those achieved by buying a more fuel-efficient car. Thus we can see that adjusting one’s diet to include fewer animal-based foods and less red meat is likely to save money and provide health benefits5while significantly reducing carbon emissions. 1. Number of per capita miles is based on Highway Statistics 2003, U.S. Department of Transportation, https://www.fhwa.dot.gov/policy/ohim/hs03/. Fuel economy data was gathered from U.S. EPA https://www.fueleconomy.gov and used 2008 fuel economy ratings. The 2008 ratings include updated estimates, which account for more realistic driving conditions. Note that the embodied energy of the vehicle, or the energy to manufacture and service the vehicle has not been included in this analysis. 2. Although the average American needs about 2,100 Calories per day, food waste and overeating explain the relatively large per person production of food in the United States. See Eshel and Martin (2006). 3. The number of animal Calories consumed is based on per capita food supply data from the Food and Agricultural Organization, with chicken comprising 19 percent, eggs 5 percent, milk 41 percent, beef 32 percent, and salmon 3 percent. Vegetable-based Calories were divided between potatoes (30percent), corn (30 percent) and soybeans (12 percent). While they don’t represent the true variety of foods consumed, they serve as an estimate for the energy and carbon emissions. See Food and Agricultural Organization of the United Nations, FAO Statistical Yearbook, (2006), http://www.fao.org/docrep/009/a0490m/a0490m00.HTM#Contents_en, accessed May 1, 2008. 4. The amount of beef Calories was varied between the 540 Calories/day (high), 180 Calories/day (average) and 0 Calories/day (low; all red meat replaced by poultry). 5. Most health professionals today suggest a reduction of animal products may be good for your health. Many studies have shown that high consumption of red meat may be a risk factor in major diseases such as obesity, some cancers, hypertension or heart disease. For example, A. Cross, et al. “A Prospective Study of Red and Processed Meat Intake in Relation to Cancer Risk,“Public Library of Science Journal PLoS Medicine, 4 (Dec. 2007), e325. 6. The CO2e emissions for the three types of automobiles assume the autos were driven 9,800 miles per year. The CO2e emissions associated with three types of diets shown (High, Average, and Low) all assume a 3,700 calorie diet, but vary in the percentage of Calories from animal products (High Diet – 38 percent; Average Diet – 28 percent, and Low Diet – 18 percent) and the type of meat eaten (High – red meat; Average – mixture of red meat/poultry; Low – poultry only). See text for further details of these calculations. A carbon offset is a payment you can make to a third party to remove or offset your own carbon emissions from the atmosphere. If you wanted to offset the emissions associated with flying from Los Angeles to Atlanta then you could pay someone to plant trees that would absorb (over a few years) your one ton of emissions. This would make your flight carbon-neutral. However, not all carbon offsets are equally effective in reducing emissions. What would happen if the trees you had planted for your flight offset were to burn down? Yep, all your carbon goes back into the atmosphere. Critics of carbon offsets not only challenge the validity of certain types of programs, but they also suggest the “pay to pollute” mentality that carbon offsets may encourage is counterproductive to stimulating real change. While this may be true in some cases, well-designed carbon-offset projects, when managed in an honest and open manner, can promote practices such as renewable energy or enhanced carbon uptake that really do reduce emissions. While recognizing the debate on carbon offsets, we have chosen to use them for the energy associated with publishing this book only after as many steps as possible were already taken to reduce emissions. This episode overviews some not-so-familiar energy resources, as well as renewable and sustainable resources. – Where is it useful? – Why not use them yet? – Where are these resources highest? – Which energy sources are perpetual? This episode explores the history of human energy consumption and modern trends in energy consumption. – Percent of energy from renewables, fossil fuels, etc. 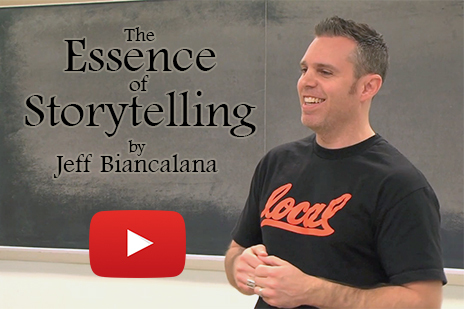 In order to help students better tell their stories, we invited Dreamworks Story artist Jeff Biancalana to come give a talk about story structure. 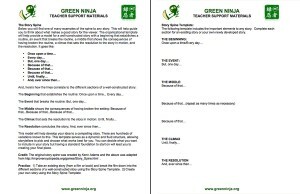 Jeff’s talk was part of a Green Ninja/BAESI workshop titled Climate Change, Scientific Storytelling, and the Green Ninja.